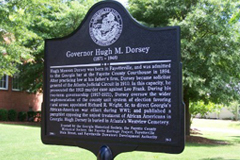 The Georgia Historical Society has administered Georgia’s statewide marker program since 1998, erecting over 250 historical markers across Georgia on a wide variety of subjects. Today those markers and over two thousand others erected during earlier chapters in the state’s marker program are available here through a searchable database. Roadside historical markers capture Georgia history in a format readily understood by travelers and residents alike. These easily identifiable markers give readers a unique insight into the stories of our shared past. 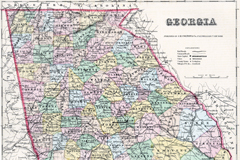 The search tools allow users to access information on markers in all parts of Georgia and even create travel routes to view markers based on individual interests such as Georgia in the Civil War or the Civil Rights Movement and can experience history where it happened. 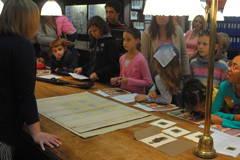 Whether through hands-on activities with primary sources in the GHS Research Center, in-school presentations by GHS staff, or curriculum aligned with state and national education standards, the Georgia Historical Society enables students of all ages to experience history beyond the textbook. Further, GHS is committed to helping educators meet the needs of 21st-century learners through a variety of online and in-person professional development opportunities. From NEH-supported summer institutes to self-paced online courses and interactions at respected professional conferences, GHS professional staff continue to partner with educators to improve history education nationwide. The Vincent J. Dooley Distinguished Fellows Program honors and secures Vince Dooley’s legacy for his lifelong commitment to history and higher education. 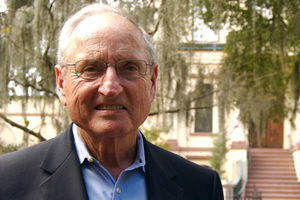 As a longtime member of the Georgia Historical Society’s Board of Curators, Coach Dooley has demonstrated his strong belief in and support of the Society’s mission as a nationally-recognized research and educational institution. The Georgia Historical Society’s Affiliate Chapter Program was established in 1996 to provide resources to local historical organizations and to provide opportunities for those organizations to learn from one another, thereby developing a more informed network of institutions dedicated to sharing the many local stories that make up Georgia’s rich and diverse history. Today that network includes nearly two hundred local historical organizations throughout the state of Georgia and beyond. 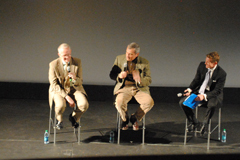 GHS coordinates a regular program of statewide lectures and public presentations that share new perspectives and scholarship with a variety of audiences. These programs regularly engage the nation’s leading scholars in lively conversation about the vital issues of our time through free, interactive public events across the state. Each year the Georgia Historical Society selects iconic companies in our state as designees of the prestigious Georgia Business History Initiative. Through the Business History Initiative, GHS seeks to teach Georgia students, citizens, and tourists alike about the pivotal role of Georgia’s leading businesses in the economic, cultural and social development of Georgia and the United States. In conjunction with the Governor’s Office, the Georgia Historical Society reestablished the Georgia Trustees as a way of recognizing Georgians whose accomplishments and community service reflect the highest ideals of the founding body of Trustees. The original Georgia Trustees, a governing body chartered and appointed by His Majesty King George II of England in 1732 to establish a new colony in North America, founded Georgia upon the principle of Non Sibi, Sed Allis, “Not for Self but for Others.” GHS and the Governor’s Office reestablished the Trustees in 2009. The Governor annually appoints new Trustees whose history-making accomplishments and service reflect the original Trustees’ ideals.